HOW LONG CAN I EXPECT MY ROOF TO LAST?? What is the roof design? Is it flat, OR a steep slope? Was it put on properly, by a trained, licensed contractor? Will you do the proper annual maintenance? Most roofs will last approximately 15 to 20 years. Some roofing materials will last much longer; such as slate, clay tile and certain metals. If you would like to discuss which roofing material will fit best you and your home, call ATW Roofing for a FREE estimate. We have a well trained staff of Uniformed, Friendly, and Drug Free Personnel. ATW takes great pride in being Military Veteran owned. 1. Inspect and clean your gutters. It’s not a fun job, but it can help keep your roof in good condition. Clogged gutters can cause standing water and leaks. You’ll also want to make sure gutters are properly fastened to each other to protect inside walls. 2. Clear limbs, leaves and debris from the valleys of the roof lines. 3. Make sure flashing is secure and is not ripped or torn. These aluminum pieces protect your roof around the edges; it’s less expensive to fix them before leaks become a problem. If you find that the scope of a roof inspection is too much for you to do alone then contact us. Our professional roofers can help you save money over the long haul with proper roof maintenance and repairs. In 1999, the material’s market share for the reroofing market came to about 4 percent. Last year, it totaled 8 percent—a large increase, albeit on a small base. “There is more awareness among both homeowners and roofers about the key benefits offered by metal roofing,” Hippard says. There are many options available for creating a new appearance, Hippard notes. “Originally, metal roofing companies offered only vertical, roll-formed panels, which don’t really fit well into suburban neighborhoods. But today, there are products that resemble shingles, tile, slate, cedar shakes and any other product.” It’s even possible to have the panels painted or treated to give the metal an aged appearance, so the “shakes” fit with the age of the home. Metal roofing must not only surmount a lack of awareness among both homeowners and roofers, but it also has to overcome an initial price differential between its products and asphalt shingles—about two and a half to three times more than asphalt. The 50-year-plus lifetime of metal roofing can create a more equitable lifecycle cost, avoiding replacement for a couple of generations, but few homeowners are considering their home’s maintenance costs 50 years into the future. The energy tax-credit law that takes effect in 2006 provides a credit for heat-reflective metal roofing, which also will save homeowners in warmer climates money on their energy bills every year—as much as 25 percent in the South. When it comes to metal roofing products best used, we’ve learned through testing and experience that metal is susceptible to corrosion from salt — some products less than others and if you’re installing near the ocean, it’s important to know which products work well and which do not perform well in these environments. Zeroing in on specific metal roofing profiles and products for the Coastal Regions of the United States is a bit challenging — mainly because there is a lot of coastland. Did you realize that 23 of the 50 states have an ocean coastline? When it comes to metal roofing products best used along the coast, we’ve learned through testing and experience that metal is susceptible to corrosion from salt — some products less than others and if you’re installing near the ocean, it’s important to know which products work well and which do not perform well in these environments. The general consensus is that galvanized steel is not a recommended choice for installations near the ocean. The salt air damages galvanized steel in a hurry. “For coastal areas, roofing materials must be extremely resistant to corrosion as well as wind uplift,” says Ed Thomas, vice president and general manager at Follansbee . “For that reason, standing seam metal roofing functions as a practical choice. Many metal roofs are guaranteed to withstand winds of 120 miles per hour and meet strict Miami-Dade certification codes. In addition, many metal roofing materials are extremely resistant to corrosion. “When properly installed, stainless steel metal roofing products coated with alloys comprised of a mixture of zinc and tin will provide the highest level of corrosion and condensation resistance available,” Thomas says. Follansbee’s own terne-coated stainless steel roofing materials coated with patented ZT (zinc/tin) alloy have surpassed 29,750 hours of ASTM B 117 salt spray testing with no signs of red rust. Many in the industry believe this is becoming more common knowledge, but it bears repeating — the least expensive education you can get is learning from someone else’s mistakes. In addition to battling saltwater conditions, hurricane force winds usually require installers to rethink their approach to installation. Many manufacturers will provide tips for installing their products in high-wind areas. The safest recommendation is to follow the codes — they’re in place for a reason. Many metal roofing systems are tested to perform in coastal environments by meeting the Florida Building Code or the stricter Miami-Dade Building Code. For coastal metal roofing installations, Taylor Metal Products of Salem, Ore., offers MarineGuard, a paint system using PPG’s Duranar SPF Coatings. Applied to 24-gauge Galvalume/Zincalume steel, MarineGuard consists of a .45- to .65-mil primer; a .70- to .90-mil top coat and a .45- to .65-mil clear top coat to hold up best in aggressive saltwater and marine environments. Taylor’s MarineGuard was employed as part of the roofing system on the Ketchikan Public Utilities Building in Ketchikan, Alaska. Andy Rauwolf of Tongass Construction, L.L.C. , in Ketchikan, was asked about recommendations for the project — to replace a metal roof that was about 20 years and had looked “shabby” for more than 10 years. The building is across the street from the ocean. Rauwolf inquired about MarineGuard and the information supplied by Taylor was enough to convince all concerned to give it a shot. The job was completed last August. Bailey says there is an additional cost to the system and it’s not as practical for small orders, as all orders are custom. The Ketchikan Public Utilities Building was about 6,000 square feet and done in Tile Red. Each year, Taylor Metal sells MarineGuard on a handful of projects and most are residential. All manufacturers will warn you about the dangers that stem from installing a metal roofing product near the ocean. It makes sense to choose a product that will endure. Have you read our Fall 2010 interview in VIE Magazine with intro by Gerald Burwell? 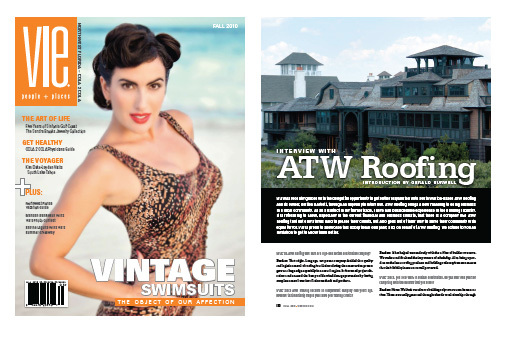 VIE was recently graced with the delightful opportunity to get better acquainted with South Walton-based ATW Roofing and its owner, Britton Bartlett, through an impromptu interview. ATW Roofing brings a new meaning to doing business in a local community. As an architect in my former trade, I have had considerable experience in the building industry. It is refreshing to know, especially in the current financial and business climate, that there is a company like ATW Roofing that not only strives hard to please their clients, but also goes out of their way to serve their community with equal fervor. VIE is proud to showcase this exceptional company, and, on behalf of ATW Roofing, we extend to you an invitation to get to know them better. Read the complete ATW Interview (PDF format) or visit the viezine website.